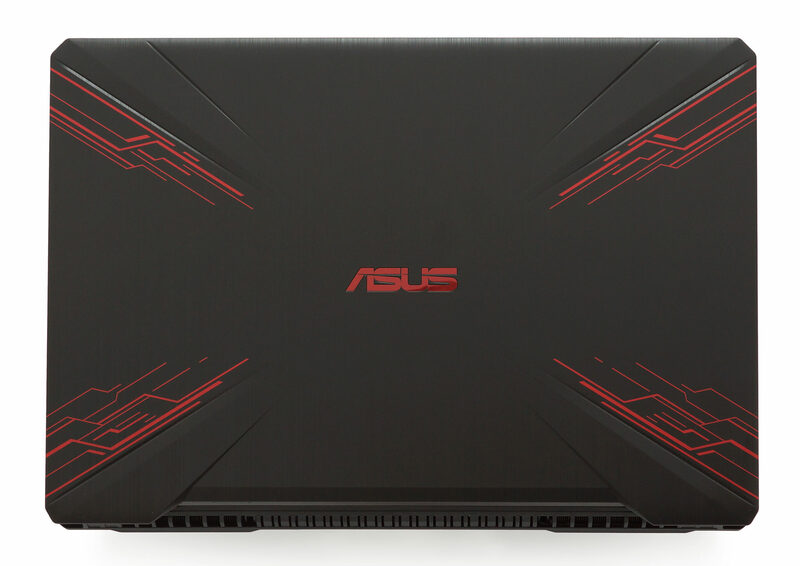 ASUS introduced a new line of gaming laptops. They call it “The Ultimate Force” or TUF and it’s aimed at both gamers and professionals. 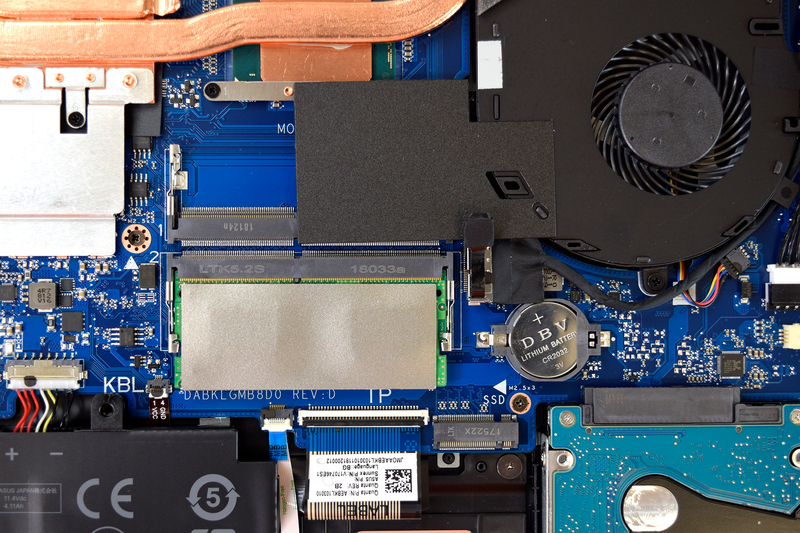 At the top of the line sits a model with the new 6-core Coffee Lake Core i7-8750H, which should make the 15.6-inch device a little workstation. Moreover, ASUS provides a choice of four different styles to suit you most. Given the GPU options, we can conclude that this is a more budget version of the premium ROG brand. Of course, for the purpose of our review, we chose the Core i7-8750H version. Alongside it, there is a 4GB GeForce GTX 1050 (it is also sold with a GTX 1050 Ti), 8GB of DDR4-2666 MHz RAM and a hybrid HDD by Seagate. In the next couple of minutes, you are going to see how the new CPU fares against its predecessor and whether more cores mean better performance in games. The first thing you see when you open the box is the device itself. 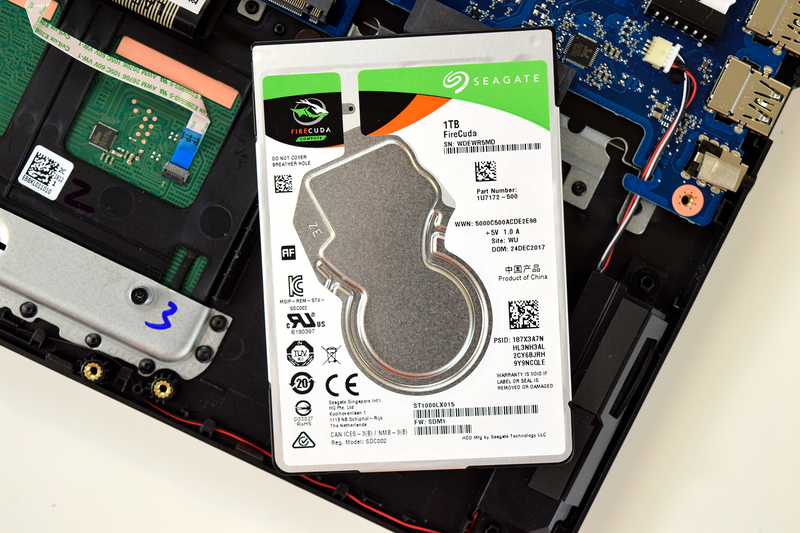 Beneath it are the usual manuals and set up guides, as well as a disk with all drivers and features… We are wondering when manufacturers will start providing more adequate options for receiving your drivers out of the box, as this model lacks an optical drive. In addition to that, there are two compartments dedicated to the cable and the 120W charging unit. 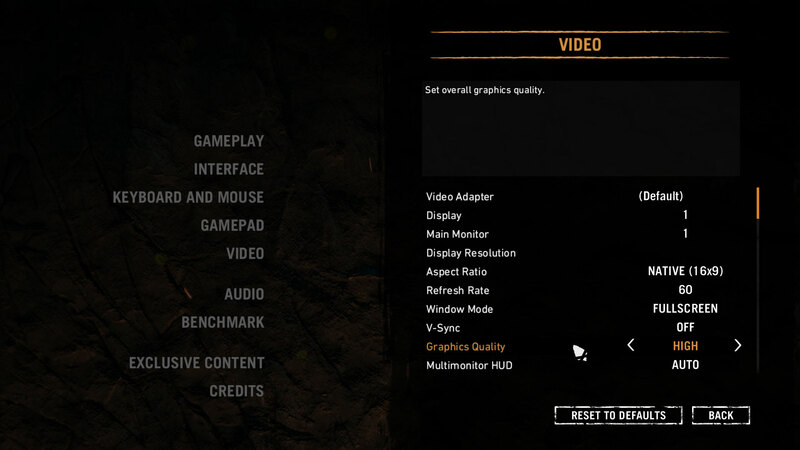 As we said earlier, ASUS offers a couple of options for the design of TUF FX504. Well, to be more precise – those options refer mainly to the top panel and the base of the device. While the changes are minor as they offer a simple alteration of the color scheme, it can make a huge difference, making you more, let’s say, presentable if you use your laptop for work mostly. The TUF FX504 itself measures at 384 x 262 x 25.1 mm (15.12″ x 10.31″ x 0.99″) and weighs 2.3 kg (5.1 lbs) – nothing exceptional for this price range. ASUS used solely plastic for the design of this device, which is a bold move, given the statements of “unprecedented reliability”. 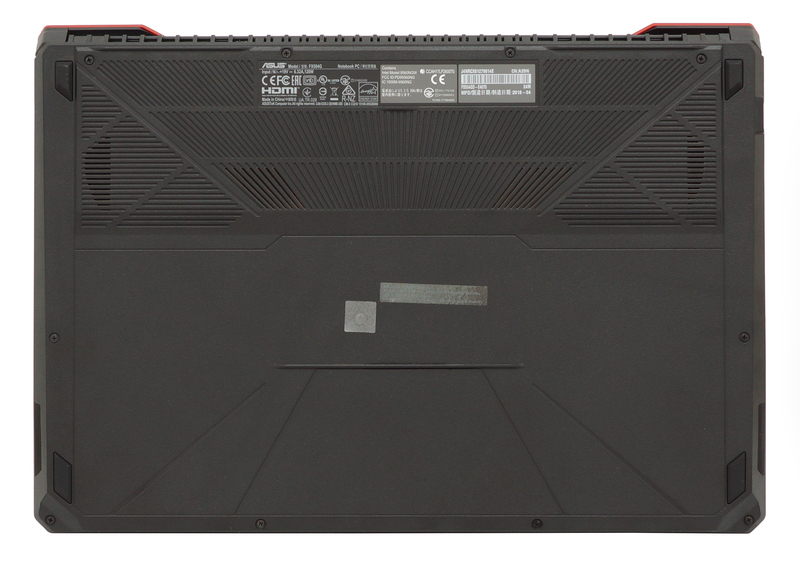 While the body of this laptop seems sturdy enough, the lid is a little bendy and is prone to scratches as well as fingerprints. However, it can be opened with only one hand. Moving to the base of the TUF FX504, we see the same plastic material we found on the top, which imitates brushed aluminum. On the topmost, we see drills for some speakers with the power on/off button right next to them. 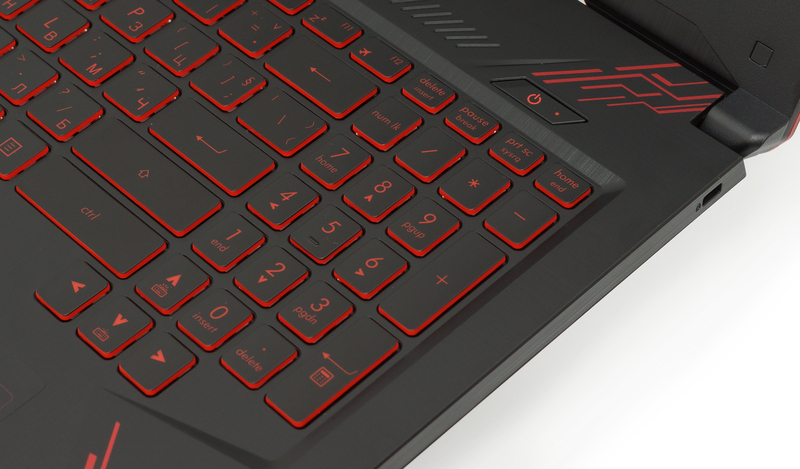 Beneath them, you can see the full-sized backlit keyboard with designated WASD keys painted in even redder than the other ones. 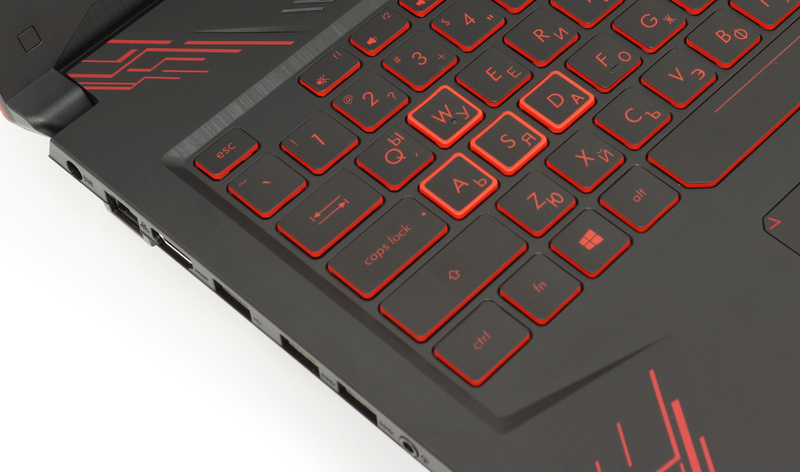 We like how ASUS has opted to pull down the arrow keys in order to preserve their size, which in our opinion is mandatory for a gaming device. In addition to that, keystrokes feel a little bit soft, although the travel is long enough. Here, the company has not missed the opportunity to brag about the durability of their keys, which are rated at 20 million clicks. Next, we have the touchpad. No matter how much we wanted, we weren’t able to test it as we experienced problems with the drivers. We hope that newer versions of Windows won’t have that problem, or ASUS are going to address the issue soon enough. However, we are not sure whether the issue iss isolated to our unit only, so if you have an ASUS TUF FX504 device yourself, please leave a comment below. Finally, we are going to look at the sides of the laptop. What we like here is that the right side is completely free of I/O ports at the expense of the other side. There we can see the charging plug, RJ-45, and HDMI connectors, as well as three USB Type-A ports of which two are 3.0 and one is 2.0. Lastly, we got the combo 3.5 mm audio jack. There is also one speaker on both sides of the ASUS TUF FX504. At first glance, ASUS TUF FX504 looks like it has a service panel. Don’t let them fool you, though. This is only a texture and you need to remove the whole bottom plate to access the internals. However, this is easy enough as you only have to deal with 11 screws. As you can see, the manufacturer has used only two heat pipes to cool the GTX 1050 and the newest Core i7 by Intel. One of them is significantly larger than the other and is shared by both chips. This design is controversial, as it can be a two-edged sword. Its effectiveness drops significantly if you use a program that is both CPU and GPU-intensive. However, if you are playing a less CPU-intensive title the second fan will help cool the GPU as well. Here you can see the two RAM DIMMs which support 32GB of DDR4 memory. 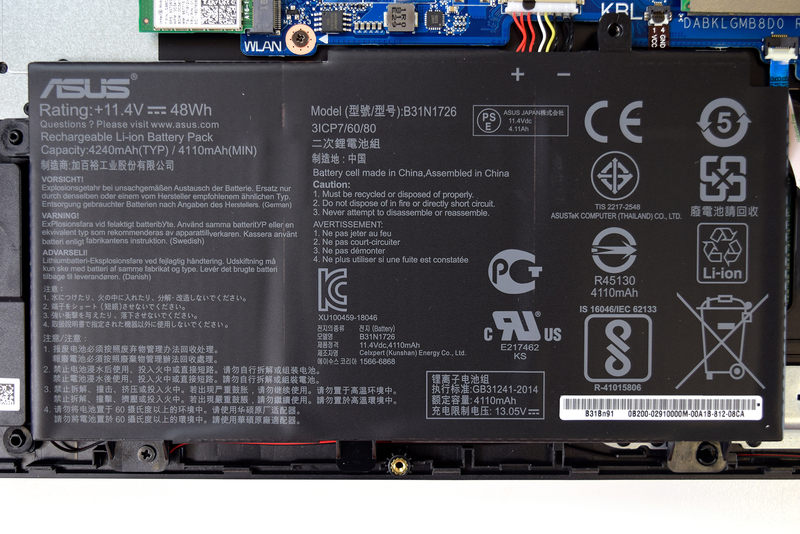 Next is the battery – a 48Wh unit with 3 cells. In the image below are visible both storage connectors. One of them is an M.2 slot that supports NVMe SSDs while the other one is a SATA port, currently occupied by the Seagate FireCuda Hybrid HDD. It features 8GB NAND memory, serving as the cache to the 1TB Hard Drive. ASUS TUF FX504 in the configuration we tested is equipped with a Full HD IPS panel with a model number AUO B156HAN02.3. It has a diagonal of 15.6 inches and has a resolution of 1920 x 1080, leading to a pixel pitch of 0.18 x 0.18 mm and a pixel density of 142 ppi, thus making it appear as “Retina” when viewed from at least 60 cm. We measured a peak brightness of 242 nits in the center of the screen and 239 nits as an average across the surface with just 6% maximum deviation. The correlated color temperature on white screen at maximum brightness is 6920K – a bit colder than the optimal 6500K in sRGB. However, along the grey scale we get a slightly warmer image – 6710K. 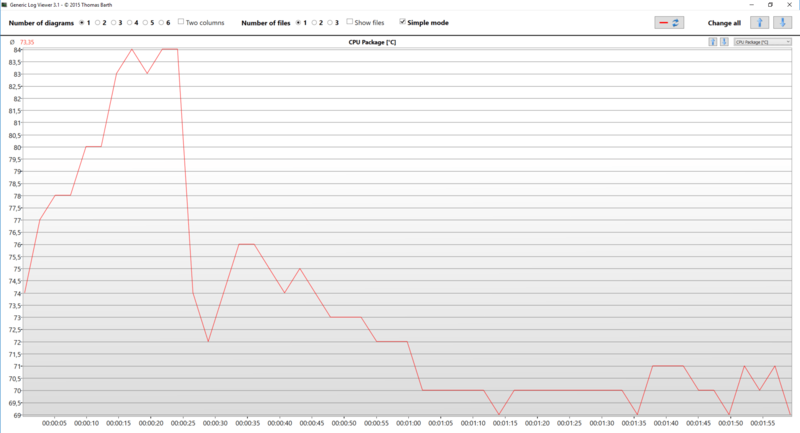 You can see how values change at 142 nits or in other words – 57% brightness. Values above 4.0 are unwanted and should not be present. The contrast ratio is excellent – 1480:1 (1460:1 after calibration). ASUS TUF FX504’s display covers only 54% of the sRGB color gamut. This panel does not use PWM to set its brightness at any level. That means the screen is comfortable and less intrusive in this aspect even for extended periods of use. ASUS TUF FX504’s IPS panel has a Full HD resolution, comfortable viewing angles and exceptional contrast ratio. Moreover, it doesn’t use PWM for brightness adjustment which makes it comfortable to work with. However, there is one slight setback – poor color reproduction. Despite the good contrast, this panel can display only half of the colors in the sRGB color space. ASUS TUF FX504 has a good sound, although a little too quiet to our likings. However low, mid and high frequencies are free from deviations. However, we have to note that we had some problems with the touchpad driver, which should be fixed with the latest versions of Windows. This doesn’t mean you are going to have problems with it, though. Also, make sure to install the latest version of BIOS you can find in the ASUS’s website, as it fixes the problem of the underperforming Core i7-8750H. As always, the battery tests were run with Windows power saving setting and Wi-Fi turned on, and the screen brightness adjusted to 120 nits. ASUS TUF FX504 is equipped with a 3-cell 48Wh battery. 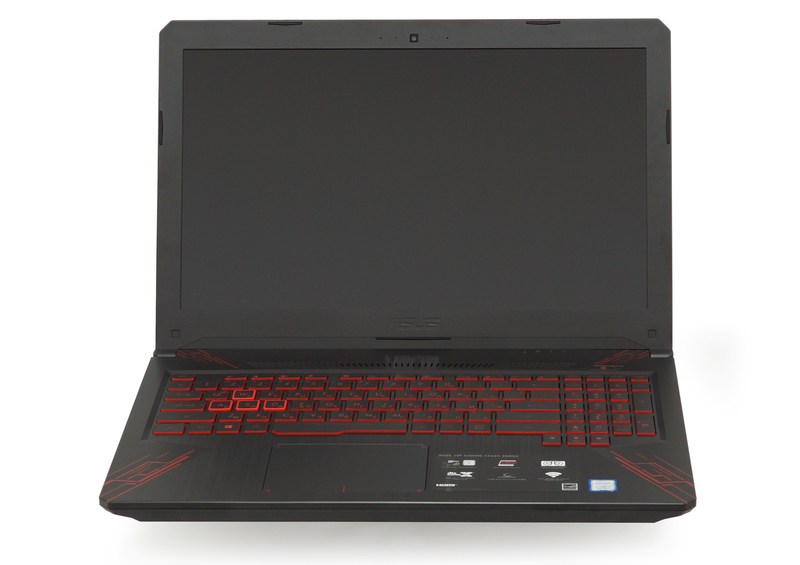 Typically for a gaming laptop, it didn’t impress us with huge times on battery power but still – 4 hours and 20 minutes of web browsing, near 4 hours of video playback, and if you are enthusiastic enough to play games away from the plug – you have no more than 1 hour and 38 minutes. Intel Core i7-8750H is a direct successor to the Core i7-7700HQ. The new Coffee Lake processors feature six physical cores instead of the just four found on Kaby Lake CPUs. Moreover, the blue company was able to fit the extra two cores on the same 14nm architecture while maintaining a TDP of 45W. In terms of clock speeds, we have a slight drop in the base frequency from 2.8 GHz to 2.2 GHz but the Turbo one is 4.1 GHz (up from 3.8 GHz). 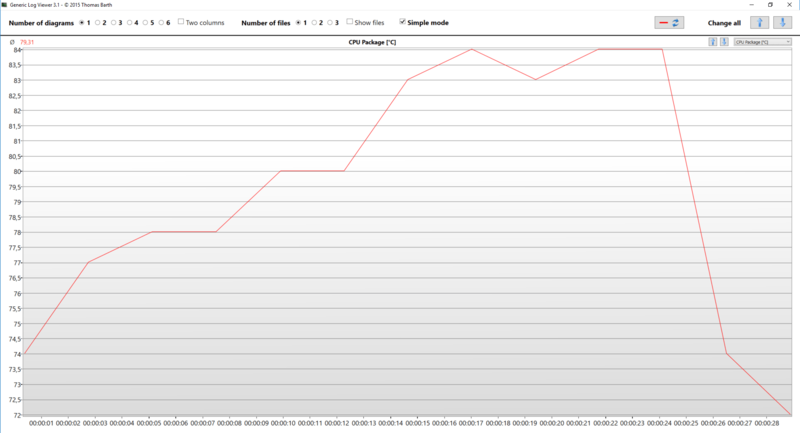 This means around 50% better performance in theory and 9 MB of cache (vs 6 MB on Core i7-7700HQ). However, the new Core i7-8750H will be more cooling-dependent, due to the higher clock count and the wide range of Turbo speeds. Here you can see an approximate comparison between the CPUs that can be found in the ASUS TUF Gaming FX504 models on the market. This way you can decide for yourself which ASUS TUF Gaming FX504 model is the best bang for your buck. Here you can see an approximate comparison between the GPUs that can be found in the ASUS TUF Gaming FX504 models on the market. This way you can decide for yourself which ASUS TUF Gaming FX504 model is the best bang for your buck. In our gaming tests, we saw a performance typical of a GeForce GTX 1050-equipped laptop. Even the most demanding titles remain playable at Full HD resolutions and low to medium settings. However, we know what you’re most interested in – did the Core i7-8750H offer any significant improvement over the Core i7-7700HQ. In simple words – no. As you may already know, very few games actually use the full power of your CPU. 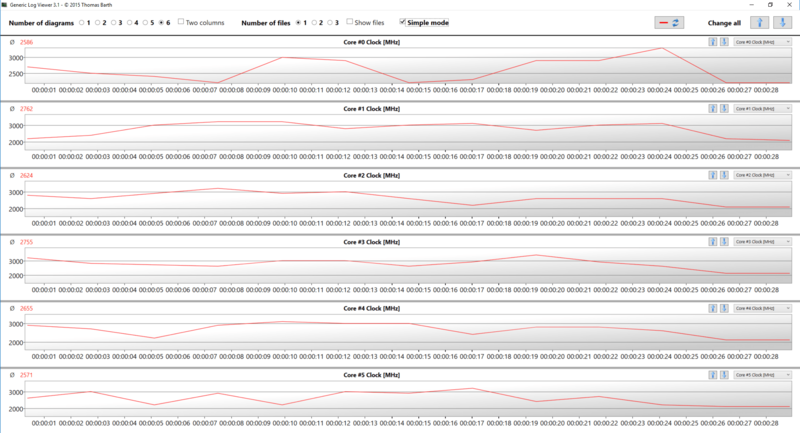 In our tests, we only noticed an improvement with GTA V, which is known for being CPU dependent. In order to get a full perspective of this, however, wait for a review of the laptop equipped with GTX 1080 along the Core i7-8750H, as the bottleneck factor will be in play. As a reminder – Intel Core i7-8750H has a base frequency of 2.2 GHz and reaches up to 4.1 GHz on a single core (3.9 GHz on all six). Idle temperature was 44°C, although it reached 84°C in no time. However, clock speeds were fluctuating around 3.0 GHz for around 15-20 seconds and at the end of the first checkpoint, we noticed a drop to 2.1 GHz. 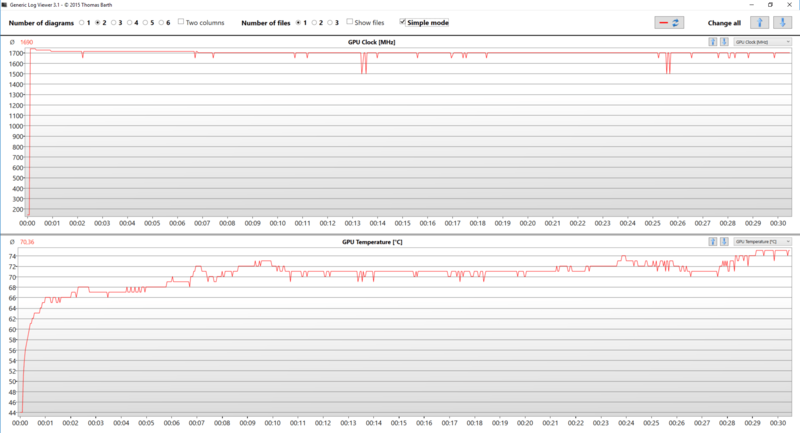 In a few seconds, core clocks stabilized to 2.5 GHz with temperatures around 70°C, which continued to the whole second checkpoint. With the exclusion of a few drops and peaks, the frequencies remained around 2.4-2.5 GHz for the entire period of our torture test. Temperatures also maintained relatively adequate at around 75°C. 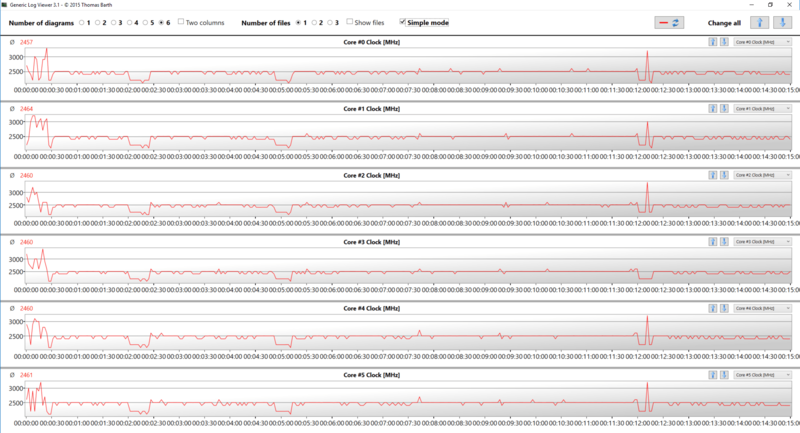 However, we think that the cooling is having a hard time with the hexacore Core i7-8750H. In the GPU department stuff was crazy as the GeForce GTX 1050 went sky high with 1690 MHz as an average. 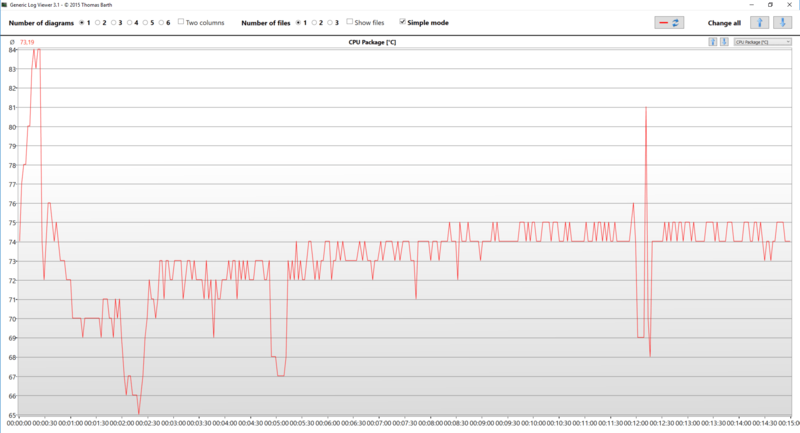 This is strong 200 MHz more than what we saw on MSI GL62M, although at higher temperatures – 75°C at the end of the test. 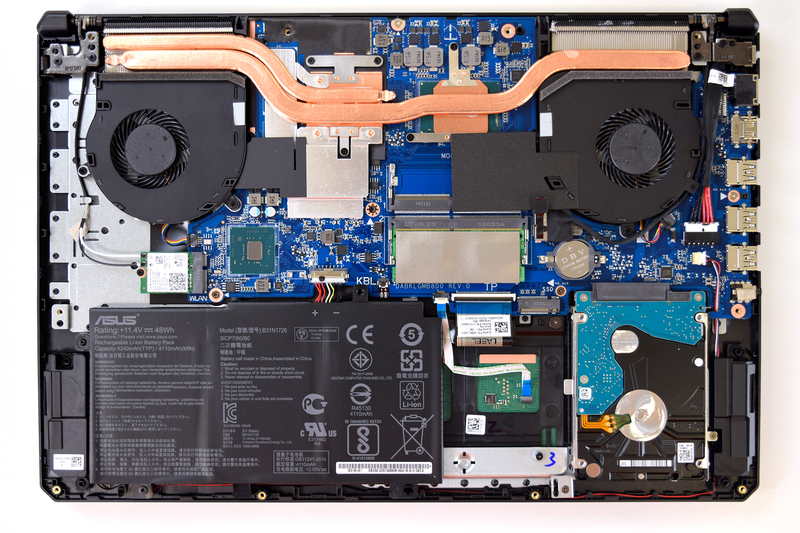 As you know, to measure the surface temperatures we put the laptops we test to extreme loads. However, the readings we got from this device got us stunned. We literally didn’t expect the temperature in the middle of the keyboard to reach smoking hot 60.9°C. This is just not right. Moreover, we noticed that the body was heating up a little too much while playing. While not being too hot to touch, it won’t be very pleasant for extended periods of use, so we hope ASUS will come up with a solution. We think ASUS has made a step in the right direction with the first device of its new The Ultimate Force series. Obviously, it is more budget-oriented but that doesn’t stop it from using the new Intel flagship – Core i7-8750H. Comparing it to devices like MSI GL62M and Acer Aspire VX15, we see a typical trend. While it completely destroys the 4-core competition at raw CPU benchmarks, on the GPU side there is almost no difference at all. Even the higher clock speeds of GeForce GTX 1050’s GPU didn’t help it stand out. Quite the opposite, actually. The only thing that went up were temperatures. In the gaming tests, there was hardly any difference, except in GTA V which, as we all know, is also CPU intensive. The difference was not as dramatic as in the benchmarks where Core i7-8750H had around 20% better scores. In GTA V, framerate was barely 5-10% higher. However, we have to say that the new Coffee Lake CPUs are going to be a lot better at rendering videos, for example. Screen-wise, it’s good that ASUS provides three options of Full HD screens, although the most common would be the IPS one and the 120 Hz TN one. We have chosen the IPS screen but given the limited color coverage, the colors were a little too dull for a gaming device. Nothing like MSI’s amazing TN panels. However, its excellent contrast and lack of PWM-adjustment justifies the panel. Battery life was nothing extraordinary unless you would settle for around 4 hours and 20 minutes of web browsing and 4 hours of video playback. If you are so desperate to play games away from the plug – you get a solid hour and a half from the 48Wh battery. 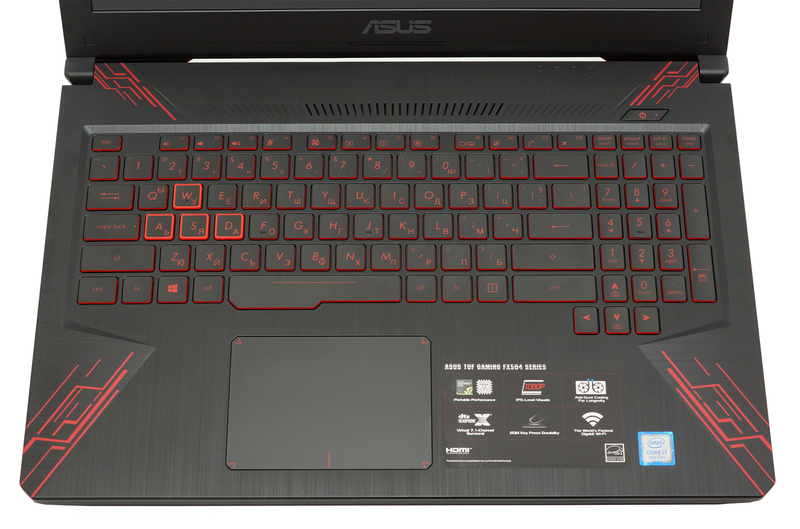 As you can tell, we don’t find ASUS’s new TUF FX504 laptop to be, let’s say, special. Although it comes equipped with the Core i7-8750H, this brings some setbacks. Our particular unit (and we are sure this will be a major issue in the beginning) had problems with the CPU underperforming. 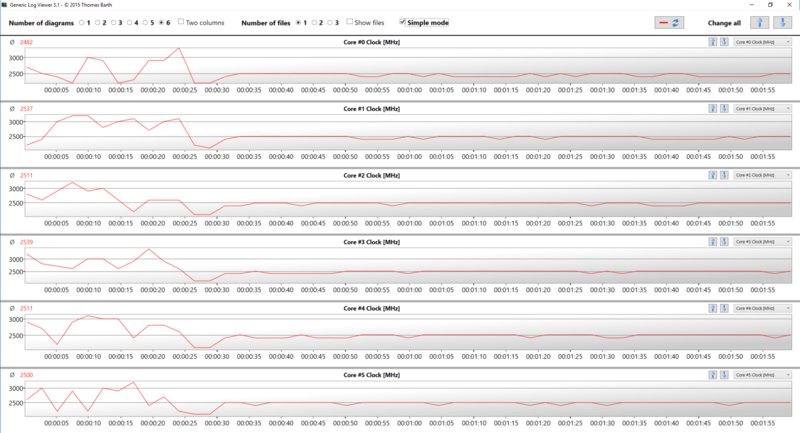 In our benchmarks, we received results which were the same, if not worse, to the Core i7-7700HQ. However, this problem was fixed by downloading the latest BIOS version from ASUS website. Nice review, except I bought this computer and it’s utter rubbish. Constant half second freezes, and now 100% disk usage issues – both are covered widely on discussion forums as common issues with this model and others and it’s driving me mad. My 6-year-old Asus is faster than this. That’s interesting. Usually, you can get 100% disk usage when Windows is updating which happens quite often, unfortunately. However, we did not have any issues with the system hanging or freezing. Did you try updating the BIOS and installing the latest drivers? Also, what CPU is the model you bought equipped with? I had to return my i5 version of the fx504 because I too had track pad issues, and GPU issues. The track pad would stop working after updating windows 10 and no driver could fix it. And my GPU was shown in the display manager but games were unable to use it, so I Was left with a gaming laptop that could not game. > Of course, for the purpose of our review, we chose the Core i7-8750H version. And of course we didn’t test it real performance. Buy one right now from our affiliated link and enjoy throttled 6 x 3100Hz! In my country, it came with windows 10 and everything was working fine until I upgraded m.2 ssd and reinstall windows 10. Is it the same issue with you case? Have you found the way to make it work? I had the same issue the first time i tried to update mine, but i restarted the PC bu long-pressing the power button, went to windows again and then checked Firmware info again, a restart was required, so I did that and then it worked flawlessly.